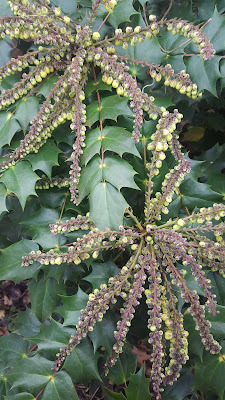 Just ready to burst into yellow flowers this is a shrub called Mahonia. This rangy shrub has evergreen foliage that is reminiscent of Holly. It is around 6 feet tall and nearly as wide, located to the left of our tool shed. Each spoke of its radial flower clusters has dozens of buds that will soon turn lemon yellow. Most surprising is their sublime spicy-sweet fragrance. 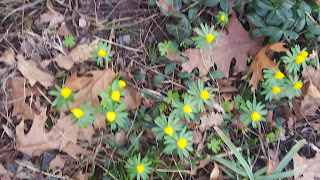 Because it's such an early bloomer, it draws the attention of any pollinator that has emerged from winter hibernation. And that will lead its pollinated flowers to become small ovoid fruits, colored like blueberries, which will form by late spring. This season, there looks to be an enormous number of clusters so on a breezy day this March don't be surprised at the heady aroma wafting through the park. 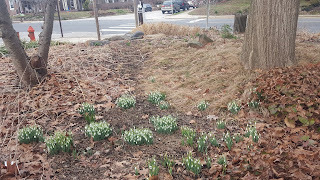 Snowdrops are already in bloom, but until the gray skies turn sunny they won't open their trio of petals to appear more like flowers than buds. The tiny bulbs in these clumps are multiplying fast. Perhaps we should divide a few clumps to creat a broader carpet of SNOWdrops? 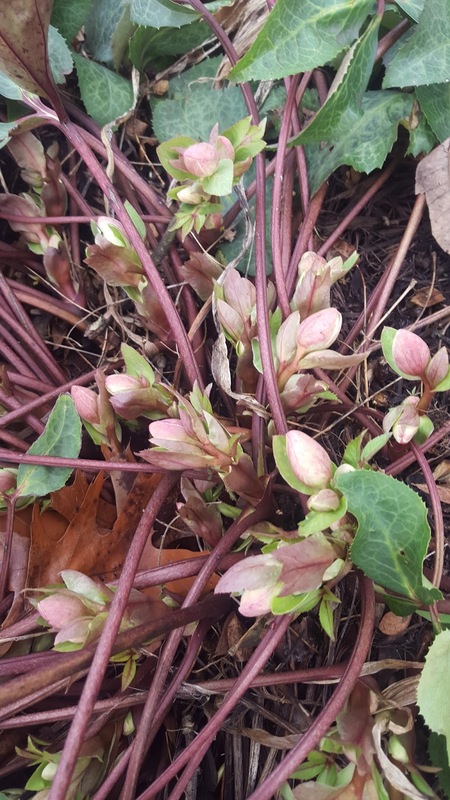 Here come our fancy Hellebore blooms. 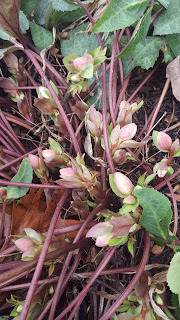 As buds emerge from the soil, they appear blush-colored, but they will open to a blend of pink, cream, and ivory. Then in a few weeks, they will turn pale celery green. The marbled foliage and dusky pink stems are last year's leaves which will soon be trimmed away to make room for a fresh new set. Look for these behind the wall of our central paved terrace. This exceptional cultivar of Helleborus x ericsmithii 'Sun Marble' is no longer available in the trade nor from our mail order source 10 years ago. Lastly, ephemeral Winter Aconite is finally starting to spread from seed dispersed as this plant disappears - both foliage and flowers by mid Spring.